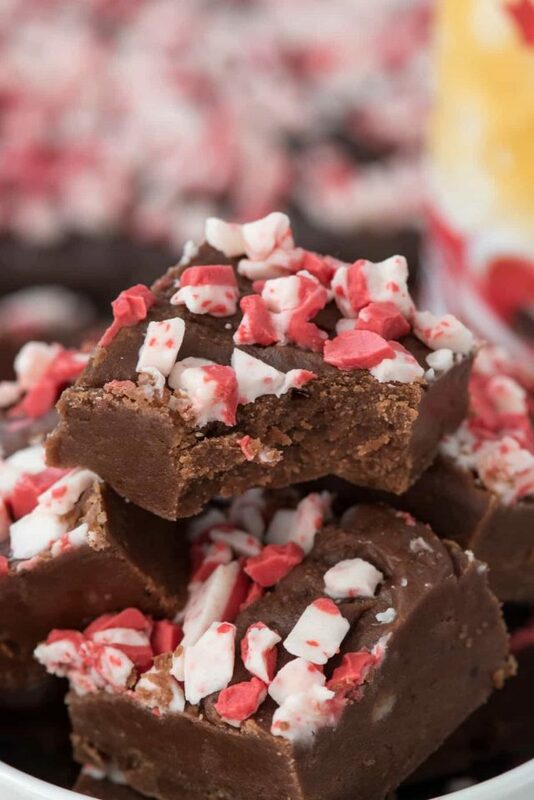 Peppermint Mocha Fudge is THE fudge you need to make this season. It’s such an easy fudge recipe and it’s so smooth, thanks to the secret ingredient: powdered sugar. It’s a cooked fudge that you don’t need a thermometer for and it tastes just like your favorite coffee drink: a peppermint mocha. I cannot wait to wrap up this fudge and gift it this holiday season – it’s gonna be a huge hit! Can I tell you a secret? I’m not a huge fudge fan. I don’t know why, but it’s never something I gravitate towards and I think I figured out why: I’ve never really eaten GOOD fudge. I’m talking about old school fudge, the kind you get at the boardwalk or in some old time store. Normally I make easy fudge, which is made with chocolate chips, sweetened condensed milk, and then add-ins like nuts or candy. That fudge is good (I mean, who doesn’t love fudge with Kit Kats?) but it’s not as smooth as silk like that candy shop fudge. A few weeks ago I traveled to New Buffalo, Michigan for a blogging retreat. One of the ladies brought a specialty fudge (I wish I could remember the brand) and it was so creamy and delicious. I felt like I’d never tasted fudge before because I loved it! It was creamy and smooth and rich and perfectly chocolatey. I came home wanting to make my own version of the mint chocolate, because it was the most popular with all the ladies there. Now, I’ve made cooked fudge before. It’s not hard but it’s finicky. Some of the most disparaging comments I get about recipes are ones that involved cooked candy, because so many factors can change the outcome. That is why, when I found this fudge recipe, I realized that I could have the best of both worlds: an easy 5-minute fudge recipe that tastes like a cooked fudge. It’s like fudge magic, this recipe. It really only takes a few minutes and the end result is creamy and perfect. I cannot wait to try this method for every single fudge recipe. I want to make butter pecan and walnut and peanut butter fudge like this! The secret ingredient? Powdered Sugar. All you do for this rich chocolate fudge is mix powdered sugar (a whole pound!) with cocoa. Then you cook it with butter, milk, vanilla, and salt until it’s smooth and has a fudge consistency. That’s when you can add any mix-ins like nuts or candy. 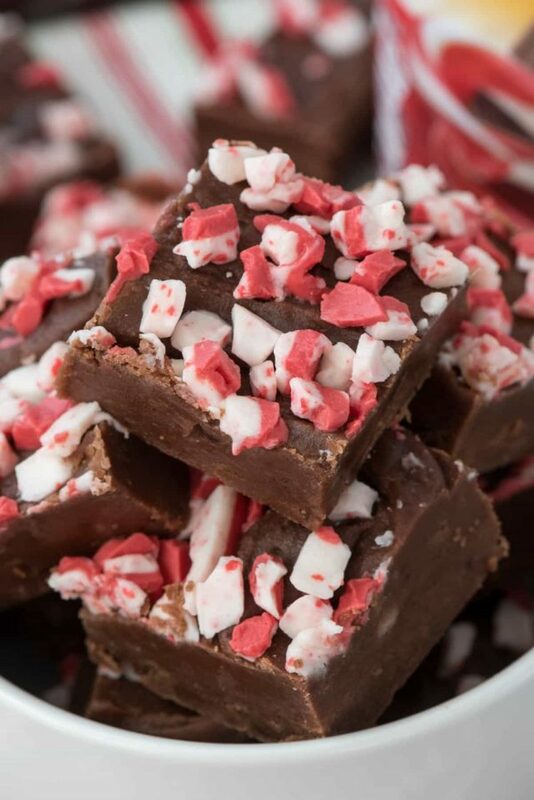 I decided to go the Peppermint Fudge route because it’s almost CHRISTMAS and I love making peppermint things this time of year. Plus, I rarely make fudge except for at the holidays. This recipe is so easy that I think I can even make Jordan do it for me at Christmas. I know I said I was going to cut down on all that I was doing this year, and one of those things was not making individualized desserts for each person. BUT…this is easy fudge at it’s best. It’s easy enough a kid can do it! 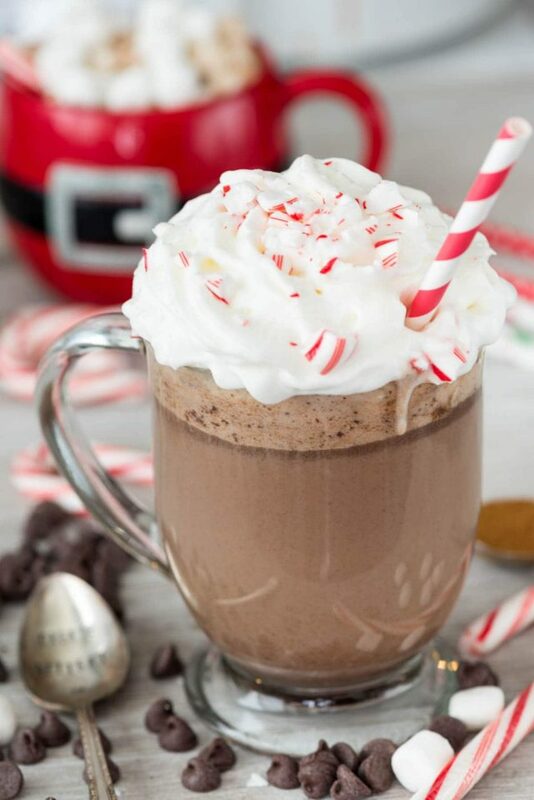 Now, when I saw that the recipe included milk, I knew exactly how I was going to change it up to make it Peppermint Mocha. Can you guess how? Peppermint Mocha Fudge is an easy 5-minute fudge recipe that’s smooth and rich and so easy a kid can make it. That’s right, coffee creamer! 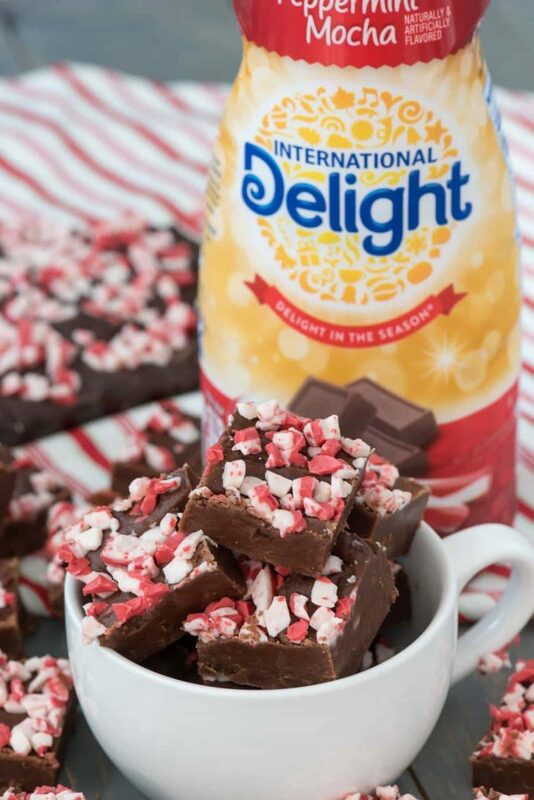 I used my favorite International Delight Peppermint Mocha Coffee Creamer in place of milk to make this a nice and rich peppermint coffee flavor. In fact, you can use ANY coffee creamer flavor. I cannot wait to try this with all my favorite International Delight flavors (Salted Caramel Mocha, Butter Pecan, Reese’s Peanut Butter Cup…to name a few). This fudge is easy to make and easy to change up to your liking. Plus it’s smooth and rich and tastes like the best fudge you’ve ever eaten! It’s best to use a scale to weigh out 1 pound of powdered sugar. You can measure it (about 3 3/4 cups) but powdered sugar packs easily. Or, just buy a 1 pound box. I like using unsalted butter, but if you use salted, leave out the salt. 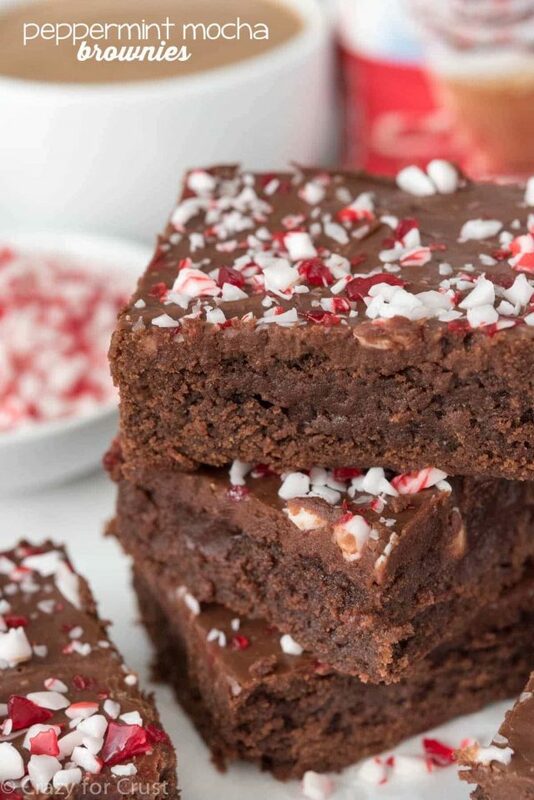 Add your favorite add-ins: nuts, peppermint candy, chopped candy bars…or leave it plain. I added Andes Mint Crunch pieces, but you can also use chopped candy bars. This is best kept at room temperature for serving, but if you’re keeping it longer than a couple days, store it in the refrigerator. 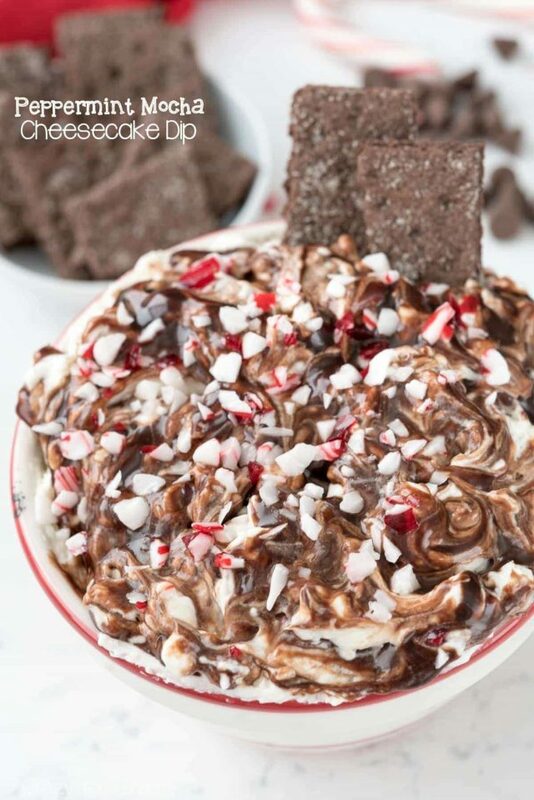 Peppermint Mocha Fudge is an easy chocolate fudge recipe flavored like a peppermint mocha drink. This cooked fudge is SO easy to make and so smooth! 8×8 inch square pan – makes the perfect size squares! Connect with International Delight on Facebook, Instagram, or Twitter. I am making these for my teacher holiday gifts! Love the flavors! Love that it is simple. I did try this recipe with the Peppermint Mocha. I think I cooked it to long as it was grainy. I made a second batch using a different flavor creamer (different brand) and that one was prefect. Mind you I still will try with with other flavors also. I give this a 5 star. ?